Measurements with GranToxiLux® and PanToxiLuxTM are superior to bulk assays e.g., LDH and 51Cr release, in terms of both time (0.3-2.0 hr. vs. 4 hr.) and sensitivity (relatively weak CTL responses against subdominant epitopes are detectable). In the figure below, CTL responses are detected with OncoImmunin's first generation cell-mediated cytotoxicity kit, CyToxiLux®. 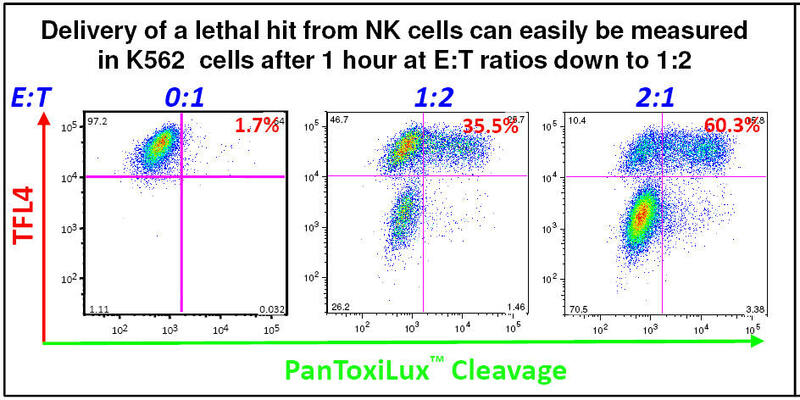 Earlier events, e.g., delivery of granzyme B and/or caspase-8 from CTLs into target cells, are now detectable by GranToxiLux® or PanToxiLuxTM.